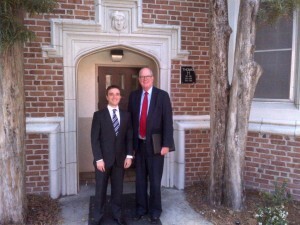 On February 13, 2012, Managing Partner, Richard Cole, and Associate, Joe Goldberg, traveled to Gainesville, Florida. Both Mr. Cole and Mr. Goldberg served the University of Florida as the Student Body President in 1974 and 2005-2006, respectively. During their trip, they were able to walk the campus and recall fond memories of their time in Gainesville. Pictured above are Mr. Cole and Mr. Goldberg in front of Mr. Cole’s former residence hall, Thomas Hall.